Red Bull have been forced to change a design feature on their cars after governing body the FIA decided that it broke the rules. 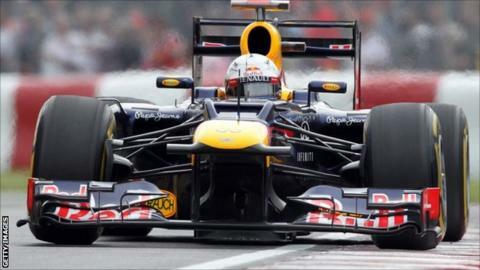 Red Bull had holes in the front axles that channelled air through the wheels for an aerodynamic advantage. But the FIA said they contravened rules outlawing moveable aerodynamic devices. It is the second change forced on Red Bull by the FIA in as many weeks after they had to modify their floor before this weekend's race in Canada. BBC Sport understands that on arrival at the Canadian GP, FIA race director Charlie Whiting felt that the holes in the Red Bull axles - which have been on the car since the start of the season - were also illegal. The holes that have been outlawed in the Red Bull axle run horizontally along the front axle, channeling air from the brake duct to the outside of the wheel. As well as helping brake cooling, they also tidy up the airflow on the outside of the wheel - and anything you can do there helps the underfloor, too. You want 100% of the air to go to the outside of the wheel, and these holes help that happen. For me, it's a debatable decision to outlaw them. Clearly they move in relation to the sprung part of the car, and that's outlawed - but so do the wheel and the brake duct themselves, which are both designed for aerodynamic benefits. So you could argue they are also moveable aerodynamic devices. It's a fine line. They worked by taking air that was coming into the brake duct and channeling it along the axles and out in the centre of the wheel. He demanded changes, which Red Bull made by blocking off the holes ahead of running in final practice and qualifying on Saturday. Whiting felt the parts were illegal under article 3.15 of the technical regulations. This dictates that "any specific part of the car that influences its aerodynamic performance… must remain immobile in relation to the spring part of the car". As the axle is by definition not immobile because it rotates with the wheel, and as in this case is influencing the aerodynamics, the holes were declared to be against the rules. BBC F1 technical analyst Gary Anderson said: "The Red Bull has holes through the axle, which is titanium, which line up with holes in the wheels. "High-energy air is channeled from the brake ducts into the holes and helps cool the brakes and improve the performance of the underfloor. "But apparently it's been seen as illegal because it's a moving aerodynamic device." The issue with the floor blew up at the Monaco Grand Prix, where rivals McLaren, Ferrari, Mercedes and Lotus objected to the holes on the basis that they broke rules dictating that the floor has to remain "impervious". The holes in the floor were on the Red Bull when they won the Bahrain and Monaco Grands Prix with Sebastian Vettel and Mark Webber. But the team have rejected claims that they had won with an illegal car, saying that it was legal at the time and had only been declared not so afterwards. Race 18:45-20:50 BST BBC Sport and BBC Radio 5 sports extra live. Race highlights 22:30-00:30; BBC One.